Home > Flexera Software, Inc.
Found 4 file extension associations related to FLEXnet Manager and 3 file formats developed specifically for use with FLEXnet Manager. 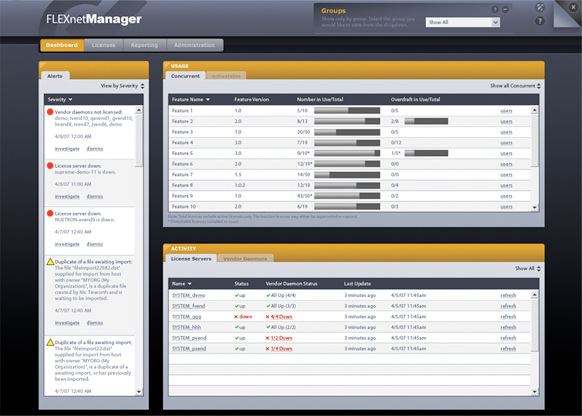 FLEXnet Manager is a powerful Web-based software license management system that allows organizations to centrally track, manage and report FLEXenabled and FLEXwrapped Windows software usage in order to optimize software spending, simplify license administration, reduce denials of service and improve compliance with vendor license agreements. As the market’s only solution to be truly integrated with FLEXnet licensing, only FLEXnet Manager can provide complete and accurate usage reporting for FLEXenabled applications. It’s also a key component of Acresso’s Enterprise Software Compliance Solution, which helps you gain control of your software usage, needs, and costs. When organizations don’t track their software usage, they risk buying the wrong number of licenses and being non-compliant with vendor contracts. Using FLEXnet Manager, organizations can cut software spending by up to 35% and ensure their vendor audit and M&A readiness. FLEXnet Manager provides a single console view of the licenses and license servers in your environment, enabling a single administrator to effectively manage and maintain licenses. It can also generate reports with real-time usage data to resolve issues quickly and optimize licensing operations throughout the organization. Not only does this reduce the cost of license administration but it also helps ensure licenses are available for end users who need them. If you need more information please contact the developers of FLEXnet Manager (Flexera Software, Inc.), or check out their product website.